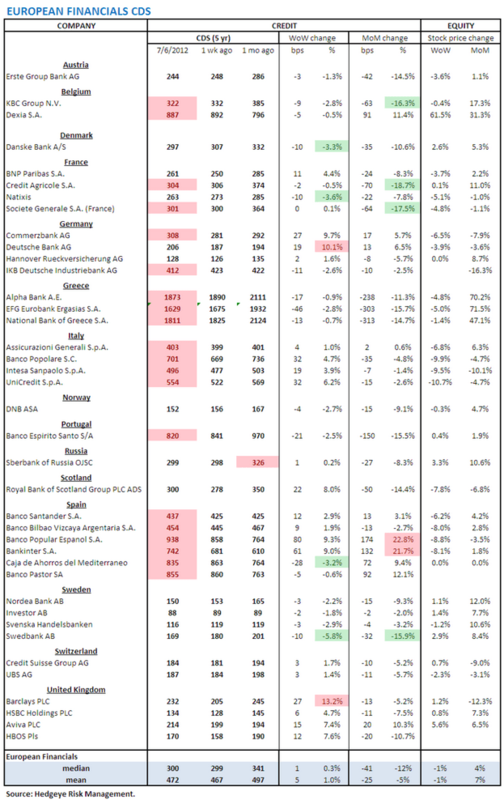 Below are key European banking risk monitors, which are included as part of Josh Steiner and the Financial team's "Monday Morning Risk Monitor". If you'd like to receive the work of the Financials team or request a trial please email . * Last week we flagged the divergence between European bank swaps and European sovereign swaps as the former were moving higher while the latter tightened. Apparently the banks remain the tail wagging the dog in Europe, as this week European sovereign swaps are higher as uncertainty once again dominates headlines. This week there is less ambiguity. German, Italian and Spanish bank swaps were broadly wider last week while French bank swaps were mixed. This is consistent with what we saw in the sovereigns. If you’d like to discuss recent developments in Europe, from the political to financial to social, please let me know and we can set up a call. European Financials CDS Monitor – UK, Spanish, Italian French and German banks saw swaps widen last week. Greek banks tightened. Overall, 21 of the 39 European financial reference entities we track saw spreads widened last week. The median widening was 0.33% and the mean widening was 1.03%. 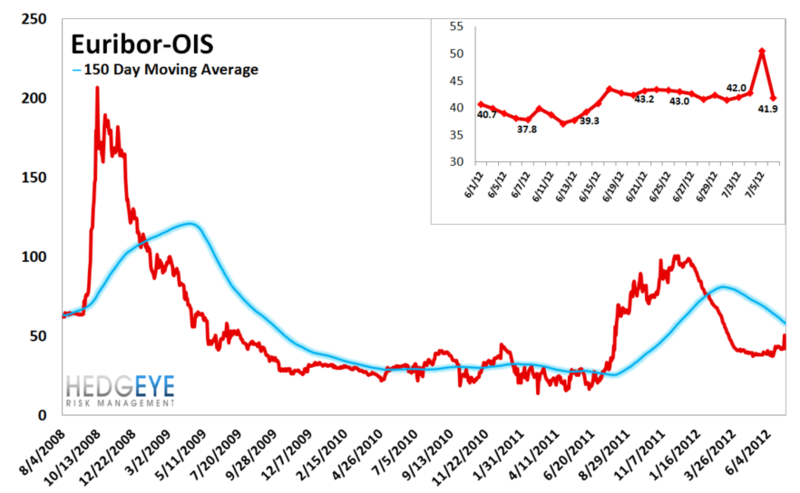 Euribor-OIS spread – The Euribor-OIS spread widened by 1 bps to 42 bps.The Euribor-OIS spread (the difference between the euro interbank lending rate and overnight indexed swaps) measures bank counterparty risk in the Eurozone. 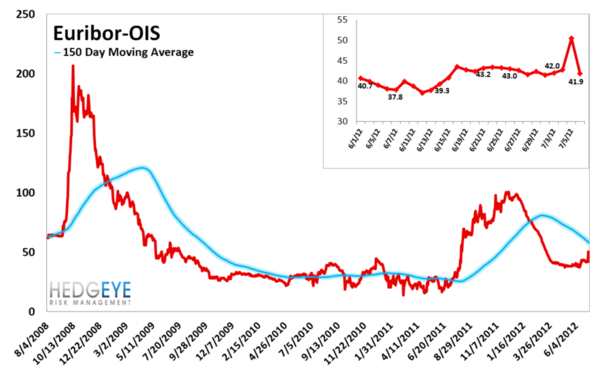 The OIS is analogous to the effective Fed Funds rate in the United States. Banks lending at the OIS do not swap principal, so counterparty risk in the OIS is minimal. By contrast, the Euribor rate is the rate offered for unsecured interbank lending. Thus, the spread between the two isolates counterparty risk. 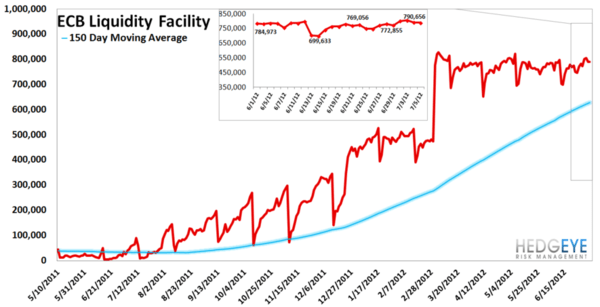 ECB Liquidity Recourse to the Deposit Facility – This index remains near its all time peak. The ECB Liquidity Recourse to the Deposit Facility measures banks’ overnight deposits with the ECB. Taken in conjunction with excess reserves, the ECB deposit facility measures excess liquidity in the Euro banking system. An increase in this metric shows that banks are borrowing from the ECB. In other words, the deposit facility measures one element of the ECB response to the crisis. This chart shows data through Thursday. 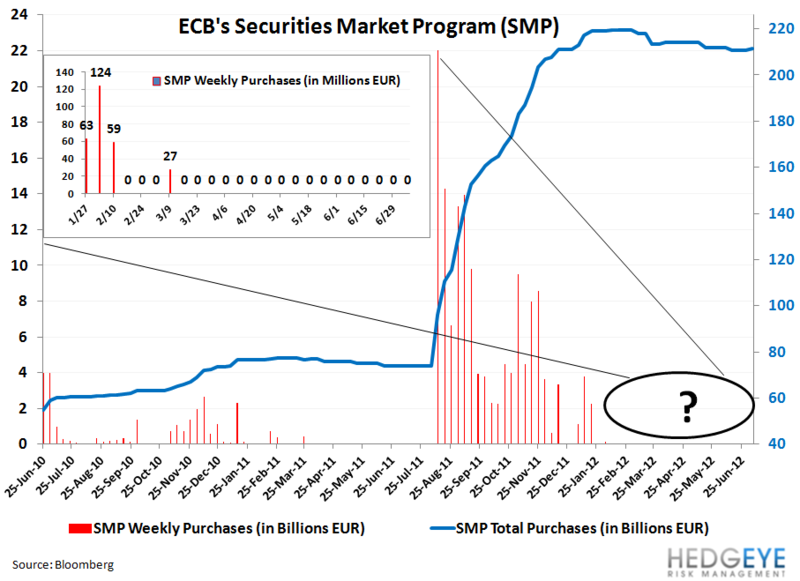 Security Market Program – For the seventeenth straight week the ECB's secondary sovereign bond purchasing program, the Securities Market Program (SMP), purchased no sovereign paper for the latest week ended 7/6, to take the total program to €211.5 Billion.